When I was a little girl, I used to love dressing up on Sundays for church. In case you missed the memo, I was the prissy one and my sister was the tomboy. 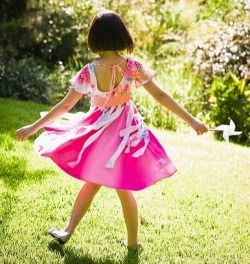 I loved nothing more than twirling in my dress and seeing it flair out around me. Even if it was the hand-me-down from our frequent sister-matching-dresses...so I was essentially wearing the same dress FOR-EV-ER. I've realized something as a grown-up. Somewhere along the way, I thought I had to dress up for Jesus. Growing up in the church, I somehow took to heart BIG TIME that I needed to put on my Sunday best and twirl around and try to dress up all nice and pretty. That's what being a Christian is, right? Doing the right things. Saying the right things. Responding the right ways. A pretty little dressed up version of being a Christian. Plastic smiles and facades. Like the fig leaves of Adam and Eve. Covering the truth of my struggles. Here's what my mama didn't tell me about being a Christian. It's messy. I grew up in the church with the most sincere teachers and leaders, encouraging me to walk with Jesus. No one intentionally mislead me. Perhaps I just misinterpreted things. But I saw Christianity as this holding hands with Jesus and walking off into the sunset. On the sand. Like in the poem "Footprints in the Sand." And when the hard things happen, he'll just lift me up and carry me. Except when the hard things happened, I found that I wasn't so keen on holding Jesus' hand anymore. I wasn't so sure that I wanted to walk with him. My life unraveled and even if I had audibly heard him offer to pick me up and carry me, I'm not so sure I would have taken him up on his offer. My false ideas about a pretty and comfortable religion were shattered when the trials and deep pains of life hit me hard. And I wasn't sure what to do about it. Especially when this all happened while I was attending a Christian university. Where everyone else's life seemed on course for holding hands and walking into sunsets with Jesus. Thank goodness for what I now recognize as God's sweet provision that I got to attend a weekly Bible study called Choice. Under the teaching of Louie Giglio. If you aren't familiar with him, you should be. Because even as I realized how disenchanted I was with Jesus, Louie was pouring truth into those deep wounds. The older I get, the more I realize that I'm not the only one who is unsure what to do with Jesus when our pretty preconceived notions come crashing down. I hit a nerve last week with my blog about restoration. Seems a lot of you have been wrecked and ravished by life's circumstances. Many of you are in places of feeling laid low. It's a mixed blessing to hear from you. I've been humbled to tears by the messages, phone calls, and texts I've gotten since Friday. That I might be allowed to take dictation for what God has to say to you. It's my heart's desire to be used like that. But my heart is so very broken for the stories I've heard. I assure you, I'm carrying your burdens with you. Stories of sexual assault, drugs, alcohol, broken relationships, loss, and a plethora of others messes and trials. This world is so very very broken. And try as we might, our plastic smiles and sing-song holding hands with Jesus only carries us so far. What if I feel it is God who hurt me, not a person?...I know the right answers and have heard all the platitudes. I just need him to heal my heart. Big questions. Coming from big hurts and big confusion. I do not have the answers. I don't. But I have been in that place. When my facade about Christianity came tumbling down in the face of real life anguish. Here's what I told this reader. Here's what I think more of you need to hear. You are in great company if you feel betrayed by God. The Bible is full of stories of people who have felt this way. The church just tends to gloss over these nitty gritty wrestling matches with God. Which is unfortunate. Because I think the truth is that most of us wrestle with God far more than we walk with him. And the Bible says that is okay. If you've never had it out with him--I encourage you to do so. I distinctly remember the night during my sophomore year at Baylor that I let him have it. For all the pains and struggles I was suddenly facing, all alone. I let him know how mad I was at him. It was a rage against him. And it was a turning point. Because I felt as if he said--I knew you felt that way. Now that you're finally being honest, we can work with that. Now that it's all on the table. And for the record, this type of conversation with God may not be a one time deal. It may be a minute-by-minute attempt to seek him out. I tend to think he rather delights in this honesty far more than any facade. And certainly more than running from him. If you want to be encouraged that your feelings and struggles are not yours alone--read some Psalms where David is laid low. How about Lamentations 3? I've camped there for years. The Israelites in the desert. Grumbling. Struggling. Stumbling. Jesus on the cross--WHY HAVE YOU FORSAKEN ME? I think many of us who grew up in the church have no idea how to really get real and honest with God. We think we have to abide by platitudes and dress up for Jesus. But I've come to realize that our God is far more intimate than that. And he's big enough to take it. Here me closely, sweet bloggy friend. If you have been laid low by the storms of life, then feel free to take off the dress up clothes. Feel free to chunk the plastic smile. It's okay if you are wrestling with God rather than walking with him. I say, wrestle away, dear friends. Because I am believing more and more that God delights in authentic and genuine interactions with us. He doesn't want plastic smiles and twirly dresses. He doesn't want us to cover ourselves with a perfect facade. Jesus didn't ask people to get pretty or perfect or "right" before he interacted with them. He met them right in their mess. I've been intentionally reading the gospels the last few months. Wow. Turns out this Jesus follower has much to learn about who Jesus really is. And it has nothing to do with a feltboard Jesus with perfect hair and a big smile. It's a Jesus who dares to enter the mess and pain of hurting people with big problems. And he meets them there. The demon possessed man who couldn't be contained by chains and was literally out of his mind, living in a cave. Jesus went to him. The woman at the well, an outcast of society. Jesus engaged with her, spoke with her. Answered her needs. The woman accused of adultery, surrounded by the religious who were ready to stone her. Jesus stood up for her, and then brought her to her feet. The heart is deceitful above all things (Jeremiah 17:9). Running to Jesus with all our emotions and asking him to show up where we are weak...it's Biblical. I don't know how to emphasize or articulate all that I want to say, speaking into your pains. This is my feeble attempt. I want...no, I need you to know that your mama might not have told you these things about being Christian. But I'm here to tell you what I've learned on my road. I'm hear to say that it's okay to be like Jacob. Who wrestled with God all night long. Let's remember the fallen world we live in. That Adam and Eve stumbled and fell even in their perfect Eden. When we think of the heroes of the Bible, we see them all dressed up for Jesus. And we forget that story after story tells us that these were real people who wrestled and struggled and didn't always walk perfectly. We can never touch the bottom of his oceans of grace. I think God is far more interested in our authenticity and wrestling with him than he is about fake platitudes lining a disingenious path. He knows that in this world, we will have tribulation. He said so himself. And we can far too easily forget that he is our Heavenly Father. As a parent, I can attest that I want my kids to come to me with it all. The only thing worse than my kids hurting is if they keep it to themselves and don't allow me into that hurt. I know from your stories that I've heard. Y'all are in the deep trenches of muddy circumstances, covered with the filth of pain and woundedness. Betrayal and suffering. And it's a dark pit to find yourself. It's horrible. And so unfair. I want you to know beyond a shadow of a doubt. You don't have to clean it up to go to God. He is right there with you, as surely as he was in the stomach of the whale with Jonah. And I am fighting for you, offering my prayer cover. If you find you're not on speaking terms with God right now, ask a trusted friend to hold you up in prayer, as Aaron and Nun held up Moses' arms during battle (Exodus 17). And don't be mistaken. This is a battle. Day by day, sometimes moment by moment. To just keep pressing on. So, let me remind you that following Jesus isn't about Sunday best. It's about calling out in the dark, as Jesus did in Gethsemane. Crying out to God--is there any other way? It's about remembering that God chose to enter our world. God chose to send his Son from the perfection of the heavens to the brokenness of this world. So that we can wrestle through the brokenness of this world and remember the glorious perfection that awaits us. It's a race. And there will be days you just want to sit on the curb and stop running. There will be ugly and hard days. And it's okay. Jesus is, after all, our Living Water. So run at your Father and beat your hands against his chest. Wrestle way, dear friends. He knows your heart anyway. So slug it out with him and allow the wrestling match, there in the pit. Sing some songs of David. Find comfort with the prophet Isaiah in Lamentations. And may they be the knot at the end of your rope. Just enough to get through this second. Of this moment. For today.